Yo Midnight Movie Fans! Exciting news awaits with an update on the next Curzon Midnight Movies night, a summer announcement. 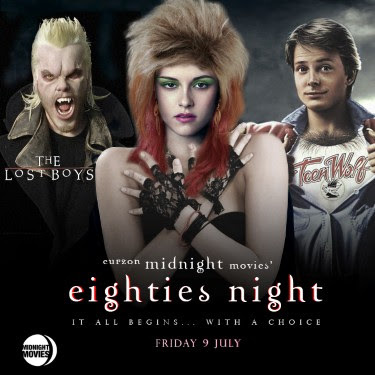 Forget that Twilight nonsense - on Friday 9 July, Midnight Movies presents the ULTIMATE battle between Vampires and Werewolves as our classic 80’s night returns! Raid your wardrobe and join us for a face-off between preppy werewolves and leather-clad vamps at Curzon Soho when we present a choice of two cult 80s films: TEEN WOLF or THE LOST BOYS. Plus karaoke before the films and a late bar with the best retro cocktails and live music from Reel Music DJs. Puberty comes with a few surprises as Scott discovers werewolf powers that make him a hot basketball player and a hit with the ladies. Dress code: will it be fur or fangs? There’s a very cool prize package for the best, including Last Exit to Nowhere t-shirts! Ticket holders must be at least 18 or older.